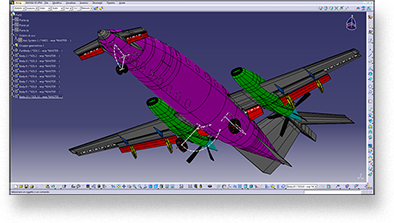 The phases of aircraft design, as many areas of engineering design in general, may be simplified into three broad categories: the conceptual design, the preliminary design and the detailed design. Each phase has to be approached using appropriate design tools. Conceptual design – In the conceptual phase, the configuration that meets the requirements in the most efficient manner is defined. At this stage, an extensive use of theory, experience and existing databases is made. The aim is to provide a fast indication of the conceptual solution consistency in comparison to the requirements. Preliminary design – During the preliminary design phase, the problem of the sizing is faced. The object begins to be shaped and the several, often conflicting, issues of the design are made compatible each other. The design tools accuracy requirements increase but empirical or semi-empirical methods, that maintain a suitable compromise between reliability and speed of use, can be still adopted. The preliminary design codes integrate into a single environment simplified models of the various aspects of design. Such codes are often developed “ad hoc” or revised to better face the problem under study. Detailed design – This is the phase in which each part of the project is studied at the highest level of detail using the most accurate available tools. The aerodynamic design, the structural dimensioning, the plant installation, etc… are studied in depth. Experimental tests are conducted together with the numerical analysis with the dual purpose of calibrating the codes and verifying the design performance. The design process described applies to all areas of engineering, adopting the most appropriate levels of detail and integrating in appropriate ways the various disciplines involved. One of the most recurring disciplines in most of engineering design contexts relates to the solid modelling. CAD passed, during its evolutionary history, from the role of electronic drawing board, at the beginning of the 80s, to the modern role of 3D solid modeller. During 90s, a further generational leap occurred with the introduction of the parametric philosophy. Today CAD systems are not just software that allow to virtually create the object, display it in 3D, verify the consistency of the final product and quickly realize 2D drawing views. The potentialities introduced by the geometries parameterization have made CADs powerful design tools capable of interacting with the most sophisticated multidisciplinary design procedures and to speed up all the design process. This generational gap has brought about the need for cultural adaption, which the role of the designer now have to take on. In order to effectively take advantage of the potentialities deriving from the integration of the multidisciplinary design methodologies, the historic separated roles of designer, developer and analyst lose their sense. The requirement to incorporate the same role with skills of strong interacting disciplines (CAD, CAE, MDO) is now imposed. experimental tests in towing tank and wind tunnel.